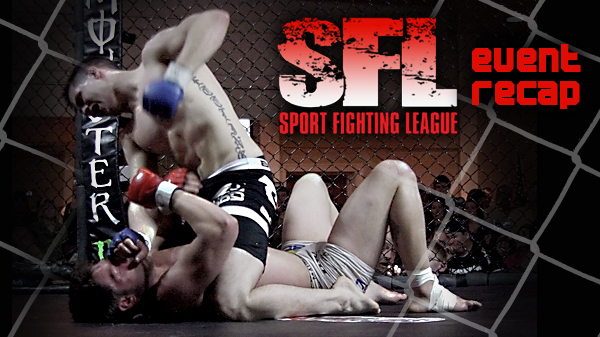 The Heart of St. Charles was filled to capacity on Friday as the Sport Fighting League kicked off the 2012 season. Friday's event was the opening round for the Gateway to the Top Tournament which could potentially land two amateur pro contracts. In preliminary matches, Mike Ettling defeated Chris Causey by Judges Decision. Jake Dowdy and Terrance Gant both won by rear naked choke. Sammy Garcia was victorious with the night's only TKO, and John Coffer won with a guillotine choke. On an shortened under card that saw two matches scrapped, Nic Yates defeated Jon Rosener via rear naked choke. Zac Paine was able to get opponent Rafael Velasquez to submit with a guillotine, and Ben Huskic was able to land a miraculous triangle choke towards the end of the third after getting bullied for two and a half rounds. In the opening round of the Featherweight Tournament, Scott Ettling battled James Mottershead for three full rounds. Ettling threw everything but the kitchen sink at Mottershead who seemed to be fueled by sheer willpower. Ettling used various submissions and strikes on Motteshead who would simply not give up and continued to move forward the entire night. After three rounds the decision went to Ettling and he will be moving on to the finals at the Ameristar Casino in March. The night's other Featherweight Tournament match saw Cory "CJ" Hunter battling Travis Draper from St. Charles MMA. Draper controlled much of the action on the ground while Hunter used his athleticism to control the cage when the fighters were standing. The two battled back and forth for 12 minutes with Draper getting the nod from the judges. Draper will be moving to face Ettling in the finals which should make for an exciting fight as both fighters are very skilled in their ground games. In what was later awarded the "fight of the night," Malcom Smith fought Kyle Walker to a decision. The incredibly athletic Smith pushed the pace of the fight and seemed to have an answer for everything Walker attempted, battling out of a rear naked choke to end the first round. Smith cornered Walker early in the second with a flurry of punches against the cage, while the rest of the round saw Smith controlling from on top. In the third and final round Smith nearly ended the fight with a rear naked choke before moving to a deep armbar. Somehow, Walker powered out it with an incredible sweep that seemingly came out of nowhere. Walker closed the final stanza with some good ground and pound. A dejected Walker was almost as surprised as the crowd was when the ring announcer called his name as the winner. Walker will be moving on to take on the winner of the night's main event. The final fight of the night saw a gargantuan Adam Meredith taking on Hugh Pulley. Meredith cutting to 170 was noticeably larger than his opponent. Pulley's much-improved boxing was center stage as he landed solid shots on Meredith early. While Pulley seemed to have an edge standing, it was clear that Meredith's submission game was better as he nearly ended the fight in all three rounds. Pulley showed tremendous athleticism and poise as he was able to escape from each of Meredith's attempts often landing in advantageous positions. When the scores were tallied it was Hugh Pulley moving on to the finals in the narrowest of judges' decisions.